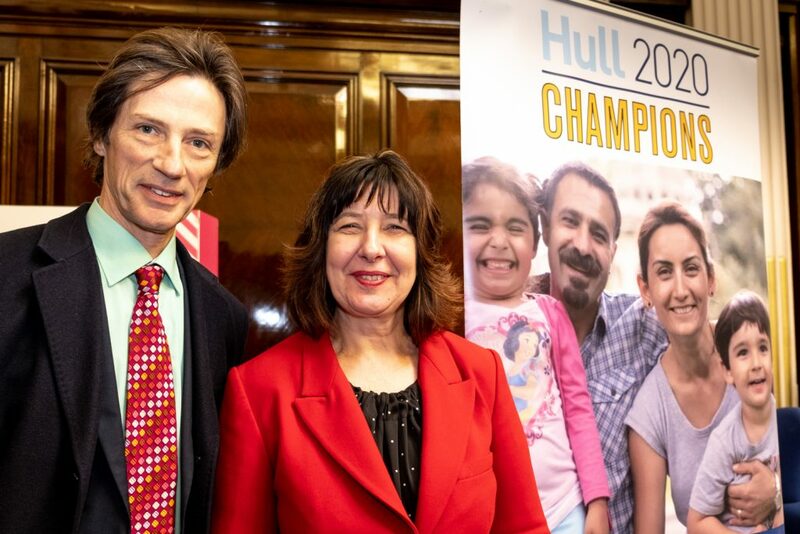 The rich diversity of community action which helps to make Hull a healthier city has been celebrated at the first annual Hull 2020 Champions Awards, presented by NHS Hull Clinical Commissioning Group (CCG) and Hull City Council. Sue Lee, CCG Associate Director of Communications and Engagement, opened the event at the Guildhall by giving some background to the aims of the Hull 2020 Champions initiative. “The Champions project is predominantly about sharing ideas with like-minded community groups, and empowering each other and our communities to really be able to look after our health. The projects really value the networking opportunity, being able to bounce ideas off each other, some really great initiatives have come from those discussions,” said Sue. She explained how the Hull 2020 Champions project has been able to provide extensive training opportunities to many people. In fact over 700 people have received training in basic life support and first aid, helping to make the city a healthier and safer place in which to live and work. The Champions initiative also helps its member projects to develop, providing guidance about funding at Funding Fairs for example. 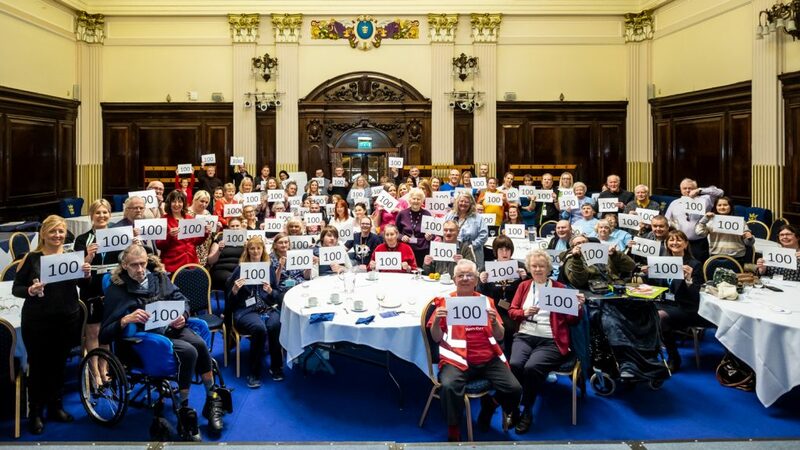 Those ‘amazing projects’ include five which were invited to give presentations about their work to the 90 or so community champions gathered at the Guildhall for the event. Dawn Barnes of Let’s Talk; Matt Wright, Police and Crime Commissioner’s Engagement Officer; and Kelly Finnis, Director of Emmaus Hull and East Riding. 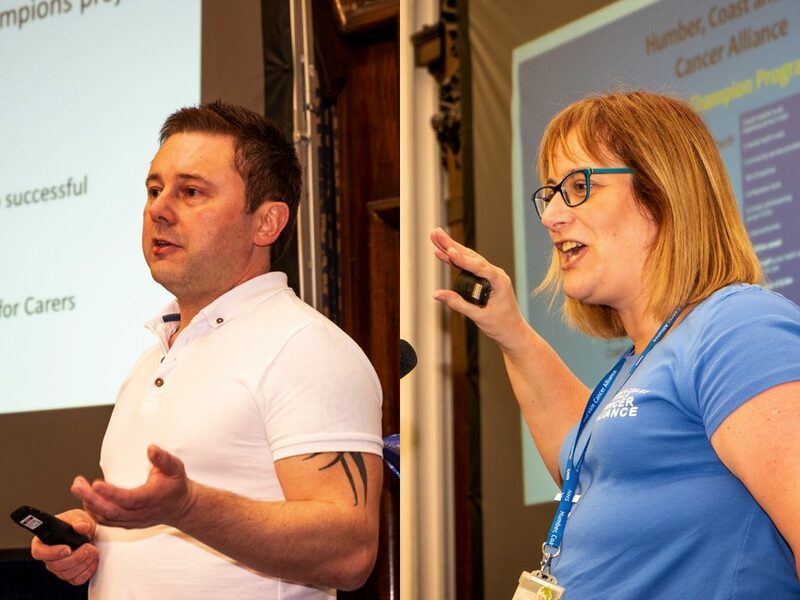 Matt Wright is the Hull Engagement Officer for the office of the Humberside Police and Crime Commissioner, and he spoke passionately about how the 2020 Campions project have helped him in his work. Matt went on to explain how signing up as a Hull 2020 Champion has been an ‘amazing’ experience, providing opportunities for training, but also helping him to develop and sustain excellent working relationships with many health and community organisations, and enhancing his knowledge of services available in the city. 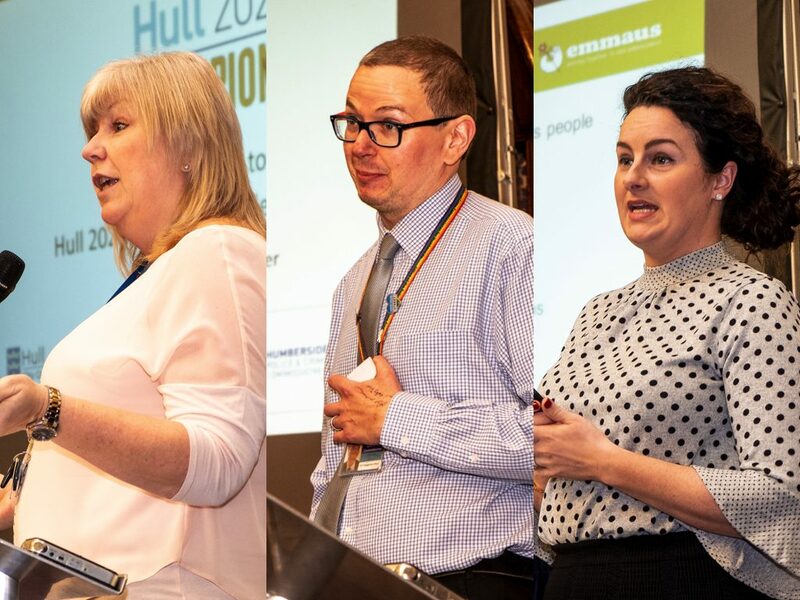 “Hull 2020 Champions gives the community a much stronger overall wellbeing and the ability to be resilient to all threats, whether it’s health or whether it’s safety,” said Matt. Emmaus Hull and East Riding provide a range of services for formerly homeless people, from their base, The Orchard, on Lockwood Street. Kelly Finnis is the director. “We provide housing for 34 people. We deliver a range of social enterprises that they can get involved in day-to-day. We also run the Rough Sleeper Outreach service for Hull and East Riding,” explained Kelly. “We were really keen to get involved with Hull 2020 Champions,” said Kelly. “We feel that what it’s enabled us to do is be part of a network that’s growing, that has a real purpose that has a real impact. We’ve benefited hugely in terms of the training and opportunities for not only for staff but or the people that come to us,” she said. Dave Edeson of Inspire Communities; and Emma Lewin, Cancer Champions. Dave Edeson established the Inspire Communities charity in 2010. It was formed to inspire people to develop a more positive outlook on life, to provide opportunities and restore hope to people by improving their economic situation, education, and general well being. “It’s here for everybody because everybody needs some help at one time or another in their life,” said Dave. Dave’s charity needed a little help too, especially to secure its future financially. He explained how the 2020 Champions project provided opportunities for him to explore funding, especially at a ‘meet the funders event’. Inspire Communities is now in receipt of financial resources which ensure they’ll be around to help their beneficiaries for another three years. Emma Lewin is volunteer co-ordinator for the Cancer Champions program, run by the Humber Cancer Alliance. Her project helps to break a taboo and get people talking about cancer, identifying the symptoms early to aid treatment, and helping people to support each other. Her project, with the help of Hull 2020 Champions, has now trained over 600 people in the city with basic cancer awareness. What was really noticeable at this event was the passion all projects had for the Hull 2020 Champions initiative. The networking is clearly valuable and effective too, as many projects talked about how they work together, sharing resources, sharing learning and support. It is this passion that the first annual Hull 2020 Champions Awards recognised as the event’s focus changed for the afternoon. Dr Dan Roper, Chair of NHS Hull CCG, and Julia Weldon, Director of Public Health, Hull City Council. Dr Dan Roper, Chair of NHS Hull Clinical Commissioning Group, explained: “The 2020 Awards are an opportunity not only to hand out some very well deserved awards, but also to share some of the truly inspirational stories behind the awards, showing what can be achieved when communities work together. “When we started out there were maybe six projects, six groups at that time. Now, we’ve just recruited our hundredth project. I think that that is real testament to the enthusiasm and dedication of the people that have delivered Hull 2020 Champions. “Hull has got a fantastic tradition of always solving its own problems, we try to deal with our own problems ourselves. The people have always proved themselves to be extremely capable, resilient, energetic, and also very caring towards people within their own communities, that they think are less well off than themselves. I think that that is a great testament to the people of Hull. A total of eight awards were presented by Dan and Julia. The projects who received awards will be detailed in a following article for Hull 2020 Champions. Be the first to comment on "Hull 2020 Champions celebrated at The Guildhall"